What Does Jeremiah 31:15 Mean? Jeremiah started to minister during the early reign of good king Josiah, who attempted to rid the house of Judah of years of gross idolatry, reinstate the Law of Moses and restore the nation to its godly roots. 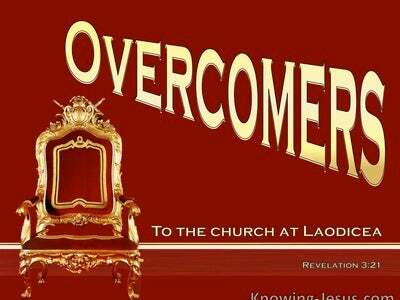 However, past decades of depravity, idolatry and sin had penetrated so deeply into the foundational core of the nation, that Josiah’s attempts at reformation were quickly swept away, after his untimely death. Jeremiah is often called ‘the weeping prophet’ because the devastation of God’s chosen people was so painful to him. God warned Jeremiah that whatever he declared to the people would be scorned and rejected… and yet he was also called to give reassurance to the nation. 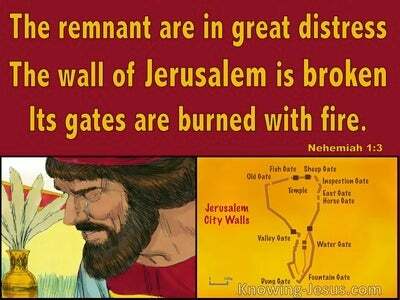 He was to prophesy that the Lord would one day restore both Israel and Judah and regather them back into the land that He promised to Abraham, Isaac and Jacob. It is in chapter 31 that we read of the New Covenant, which God promised to make with Israel – not like to the covenant He made with Moses when He led them out of Egyptian slavery. In God’s New and Better Covenant, He pledged to put His law into the hearts and minds of His people and to write it on their spirit.. so that He would be their God and they would be His people – forever. There is much in chapter 31 that gave great hope and encouragement to the little remnant of faithful Israel, but right in the middle of the chapter, Jeremiah contrasts the shocking time when Judah’s sister nation – the house of Israel, was brutally taken into captivity by the savage Assyrians. Thus says the Lord, a voice is heard in Ramah. There are lamentation and bitter weeping. 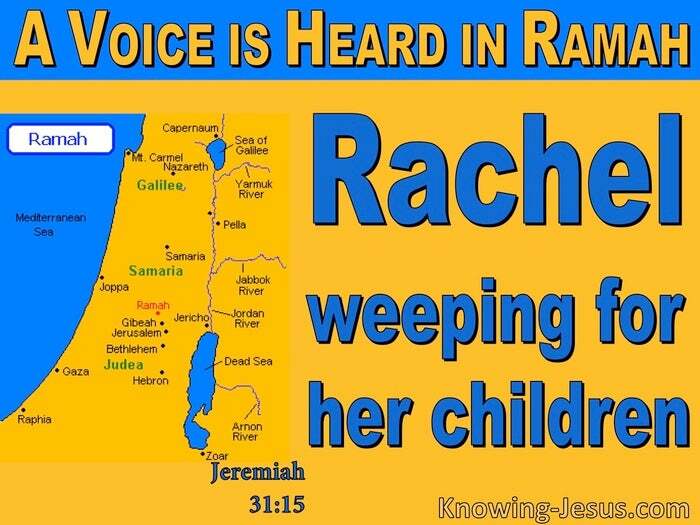 Rachel is weeping for her children and refuses to be comforted for her children, because they are no more. Jeremiah was referring to that terrible time when the Assyrians swooped down on the house of Israel, like a wolf on the sheep-fold, and carried away their precious offspring into captivity. A great cry and bitter mourning came from Ramah, which was a little town, five miles north of Jerusalem. Rachel was the mother of Joseph and grandmother to his two sons, Ephraim and Manassas. She was matriarch of the entire nation of Israel and Rachel weeping for her children, is a picture of distraught Hebrew women in Ramah, as they watched their beloved children being captured and carried off into captivity and slavery. The gospel of Matthew quoted Jeremiah when recording the slaughter of the innocent babes in Bethlehem, and the bitter pain the women there had to endure, when their infant sons were torn from their arms and brutally murdered. This massacre took place immediately following the birth of the Lord Jesus, after had He escaped into the land of Egypt. Matthew describes it as a “fulfilment” or sombre reminder of this actual event, which was part of the traumatic history of God’s errant people. This distressing historical event to which Jeremiah refers, is nestling within a section of his writings that speak of the glorious restoration, regathering, redemption and revival of Israel. Just as the women of Ramah were surrounded by promises of hope from the Lord, so too the women of Bethlehem were surrounded by the Hope of all Nations, Jesus Christ – the incarnate Word, Whom the wicked king Herod sought to destroy. 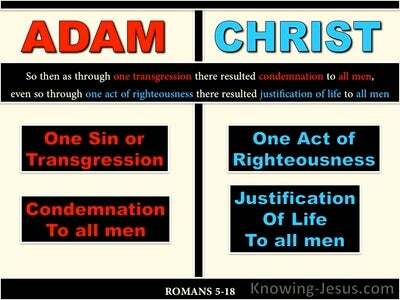 In this world we will all see tribulation and trials. We will all have times of weeping and bitter mourning – but we have a hope in Christ and a promise that JOY will come in the morning. 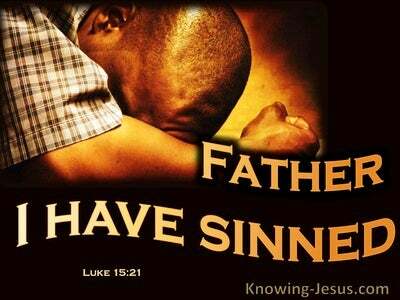 Jesus is the root of Jesse and He is a Son of Israel. He is the One that arises with healing on His wings. He is the One that is coming to rule over the nations and right all wrongs – and in Him shall the nations hope, for Christ is the Hope of ALL those who put their trust in Him. Heavenly Father, thank You for the many prophetic writing of holy men of God, like Jeremiah, who had to endure such pain and suffering so that we could receive Your written word. Thank You for the many promises that You made to Your people, Israel – despite their apostasy, and for the hope that we all have in Christ Jesus, their Messiah and our Saviour. Thank You that Jesus is coming back to right all wrongs and that by Your grace You have told us the end from the beginning. Thank You that the day is coming when You will wipe away all tears from our eyes and Christ returns to reign as King of kings and Lord of lords. Help me to learn the lessons that You would teach me and help me to anchor my hope in Christ – in Whose name we pray, AMEN.